The name Lillian is a sacred name in Disney circles. From paddlewheels to locomotives, the name of Walt’s beloved wife has been given a place of honor across the Disney theme parks. However, Lillian Disney is not the only Lillian to be found throughout Walt Disney World. Another determined and grit-filled Lillian adorns the walls at Jock Lindsey’s Hangar Bar, Lillian Boyer. 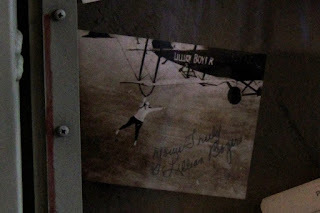 Tucked away on an airplane window turned wall decoration, between other photographs and post cards, is a photo of the daredevil signed, “Yours Truly, Lillian Boyer.” It should be mentioned that the photograph of Lillian has her clinging to a to a strut on the underside of a biplane in midflight, clinging by a single hand I might add. It’s fairly clear to see why she and Jock would have gotten along. Lillian Boyer was born in 1901and was known as, among other things, The Girl of Nerve and The Fair Devil of the Air. Beginning in 1921, Lillian began her career as an awe-inspiring aerialist that made her the talk of state fairs and air shows is 41 states. Billy Brock was the pilot in the cockpit for most of her career, but she was the main attraction. Many of the stunts she would perform were the original ideas of Billy, and others would follow suit to use some of the same maneuvers, but no other man or woman performed the stunts as often and with the same consistency that Lillian could. Changing from plane to another plane, or from a moving vehicle to an airplane, balancing on her head, and hanging from under the wing tip with one hand were just a few of the performance maneuvers that she would master. By far the most popular of her tricks, however, was hanging by her teeth. According to Boyer, the cable was attached to a strut by Lillian as she made her way out onto the wing, but once she had her mouthpiece in and the cable had gone taut, there was no way she could open her mouth until Billy had lowered the ladder and she had grabbed ahold of it, allowing some slack in the cable. While certainly her most dangerous stunt, particularly if the cable were to breakaway, Lillian stated time and again that she was never frightened. Part of that was due to the meticulous nature of Billy’s preshow checks and maintenance to make sure everything was up to snuff. One of the leading aerialists of the time, Lillian’s career was short-lived. In 1928, federal regulations prohibited low flying, rules that effectively exterminated the art of barnstorming. Her last performance was on September 9, 1928 in Bethany, MO. Amongst her accomplishments through the brief career, Lillian was able to perform in 352 shows throughout the US and Canada, complete 143 automobile to plane exchanges, and 37 parachute jumps, 12 of which were directly into Lake Erie. It’s no wonder that Jock, an airman who seems to have regularly been on the same air show circuit as Lillian, would have become fast friends with her. She seems like just the type of daring and cool under pressure individual that he would have surrounded himself with. That or he was just as enamored with her as most of the public was at that time and he was able to collect an autograph from her. Either way, her photograph certainly has a distinction among the artifacts found throughout the Hangar Bar.